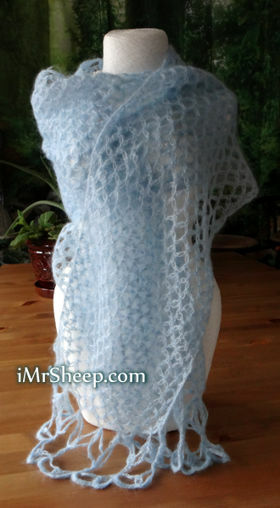 100% MOHAIR, SILKY MOHAIR, NATURAL BLENDS WITH MOHAIR - Hand Knitting Yarns, Canada. ANGORA GOATS IN CAMDEBOO, South Africa. Photography © Noro The World of Nature, Vol. 26. The word "mohair" was adopted into English before 1570 from the Arabic "mukhayar", a type of haircloth, literally "choice", and stated to mean "select choice", "silky goat-skin cloth" or "hair cloth". - Reference: Wikipedia. Angora goats are one of the oldest animals known to man. In 1853 mohair spinning began in England. Angora goats arrived in the USA around 1849. Now, their native lands are South Africa, Western Asia, Turkey, and neighbouring countries. Mohair should not be confused with the fur from the angora rabbit, which is called angora. Mohair, a product of Angora goats, is a long, slick fiber that is difficult to spin because of its smoothness. For centuries, mohair has been regarded as one of the most luxurious and best quality fibres. The Angora goat&339;s fibre grow continuously and do not moult. "Mohair is characterised by excellent lustre, durability, elasticity, resilience, resistance to soiling, soil shedding, setting, strength, abrasion resistance, draping, moisture and perspiration absorption and release, insulation, comfort and pleasing handle, and by low flammability, felting and pilling. Its good insulation makes mohair fabrics light-weight and warm in winter and comfortably cool in summer, which is also a function of the fabric and garment construction." - Reference: Robert R. Franck "Silk, Mohair, Cashmere, and Otehr Luxury Fibers". The grades of mohair vary in different countries. In general, the best quality mohair is produced from the fleece of kid goats under six months old. As it is known, mohair (as well as camel hair) is the world's strongest natural fiber - it is 2.5 times stronger than wool. It can be used in production of linings, pile fabrics, suitings, upholstery fabrics, braids, dress materials, hats, and sweaters. It is also a popular material to make teddy bears. 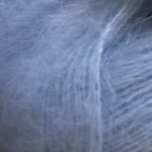 Some mohairs have cotton warp and mohair filling. This is called brilliantine (fake mohair). Today, most North American mohair fiber comes from Texas, where the majority of Angora goats are raised. Mohair yarn is mostly produced in fine brushed and looped varieties. South Africa is the world's home of the mohair industry, where you can visit International mohair summits and have an opportunity to be invited to the International mohair trade shows, National flock & fleece competitions, National ram breeders championships, and other world-class entertainments. 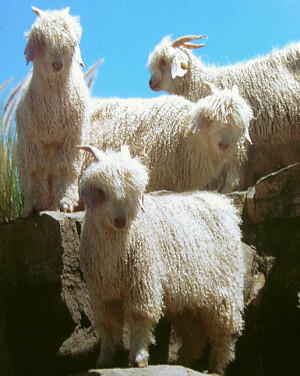 Mohair is also produced in Argentina, Lesotho, Australia, and New Zealand. If you are mohair sensitive please choose Brushed Alpaca. Alpaca fiber is lanolin free, therefore it is hypoallergenic.